New Zealand troopers at Jerusalem's Western Wall. Image courtesy of the National Army Museum, 2014.231.1. Between April 1916 and October 1918, the New Zealand Mounted Rifles took part in the Sinai-Palestine Campaign, fighting against Ottoman forces through the Middle East. The highly mobile campaign brought the New Zealand soldiers into contact with many areas rich in history and religious significance, much of which would have been familiar to them through literature and their religious education. And while the Sinai-Palestine Campaign was a sideshow of the First World War compared to the titanic struggle on the Western Front, the collapse of Ottoman power in late 1918 was to have immense long-term consequences on the history of the region. Although fighting the war was the primary purpose for the New Zealanders being in Sinai and Palestine, the New Zealand Mounted Rifles spent considerable time not fighting. Training camps and rest camps were located away from the front line, and the soldiers quickly developed an appreciation for sight-seeing, amateur archaeology and exploring religious sites. 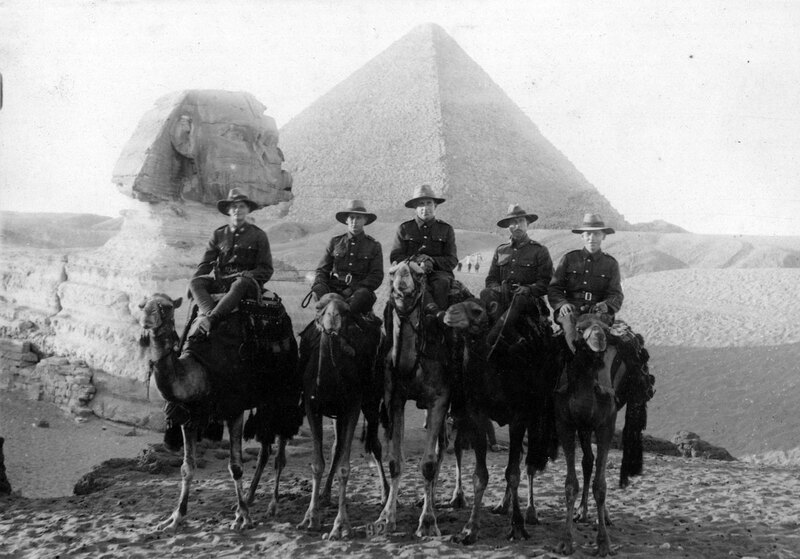 Five New Zealand mounted riflemen posing on a visit to the Sphinx in Egypt. Sidney Grant is at right. Image courtesy of Wairarapa Archive, 11-130/2-27. 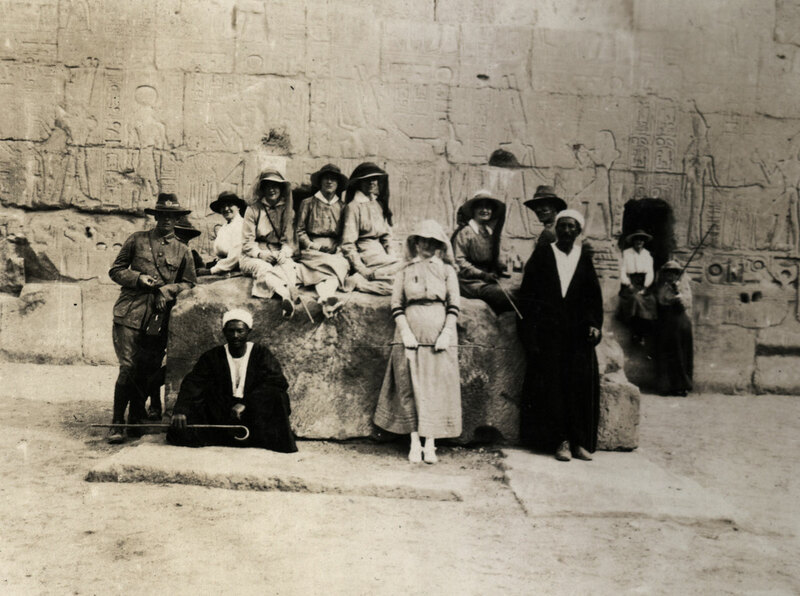 New Zealand Sergeants escorting a party of British nurses on a tour in Luxor, Egypt. Image courtesy of the National Army Museum, 1993.1285. Sight-seeing was very important and popular for the New Zealand soldiers. It began almost immediately after their arrival in Egypt, with soldiers anxious to see all that Cairo had to offer. Major sights visited included the pyramids, the sphinx, the bazaars, the tomb of Mohammed Ali and the Citadel. Large numbers of Egyptians waited outside Moascar camp, selling their services as tour guides. Enthusiasm for touring did not cease when the soldiers moved into Palestine. 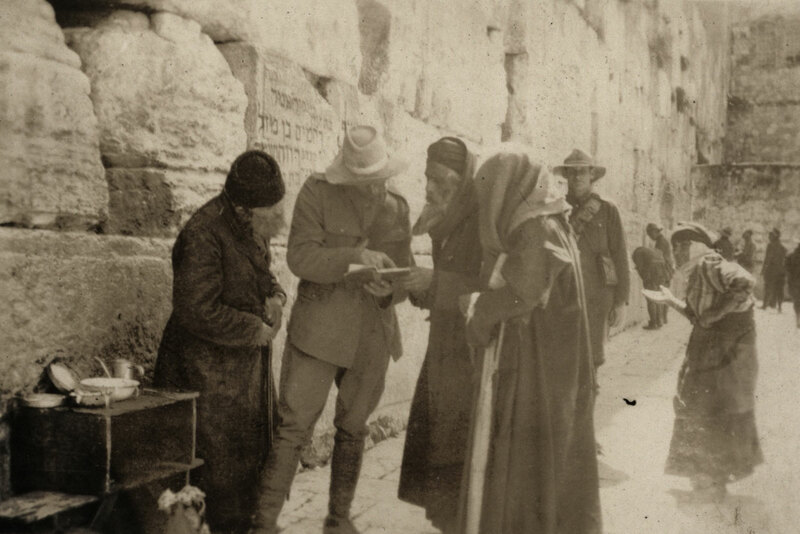 Many visited the Biblical sites which they would have read about since they were children, especially in Jerusalem following its capture in December 1917. Soldiers commented on ‘The great blue wall of this plateau of Judea is the most characteristic sight from the plain and from it the Israelites of old looked down upon the country that was filled with corn and wine and olives,’ visiting the Garden of Gethsemane, the Church of the Holy Sepulchre, Mount of Olives, and the Virgin Mary’s tomb. 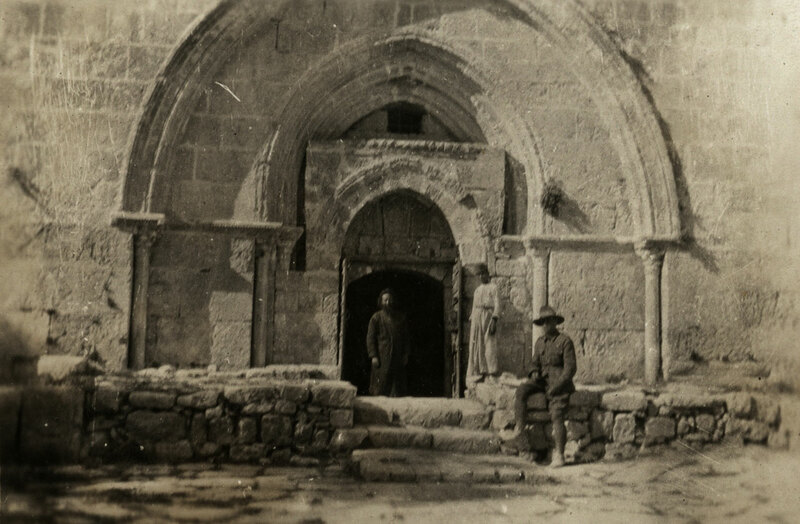 Military chaplains were enthusiastic tour guides, organising parties of soldier and explaining the history and significance of the sites visited. 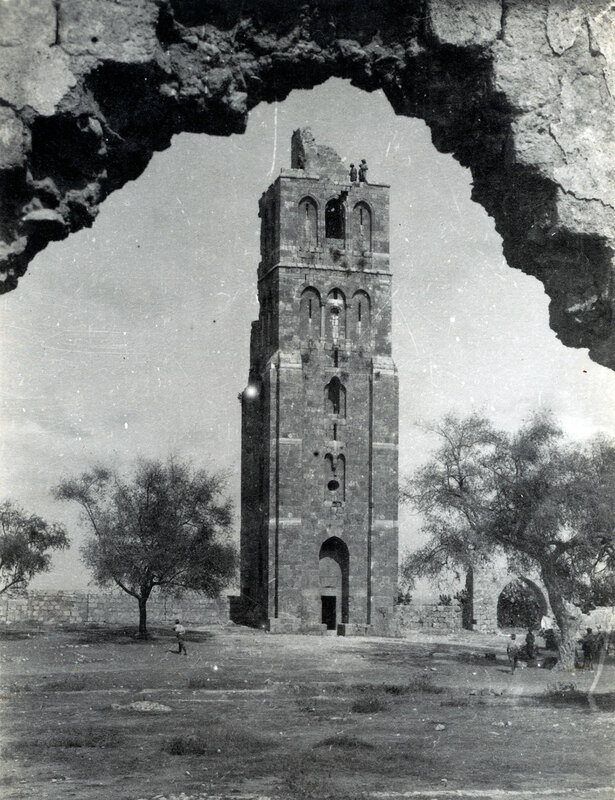 A group of soldiers inspect a thirteenth-century minaret in the town of Ramla, Palestine. Image courtesy of Wairarapa Archive, 06-78/3-12. 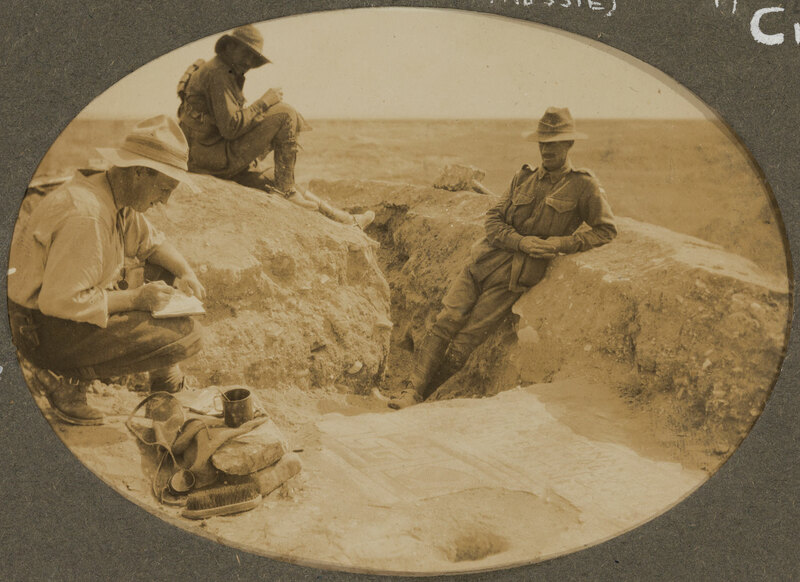 Sapper Francis McFarlane sketching the Shellal Mosaic, uncovered following a battle with Ottoman forces near Gaza. Image courtesy of Hocken Collections, Album 213, P1993-024-012c. Read more on the Hocken Blog. Unsurprisingly, amateur archaeology was also a popular pastime. The area traversed by New Zealand soldiers contained 5,000 years of civilisations. Artefacts were easily acquired and foraging expeditions for remnants of lost civilisations were popular. Most men would have been familiar with the Bible and would have recognised the area they were passing through and had some knowledge of its history and the rise and fall of many cultures. In Western Egypt soldiers discovered the remains of a Roman palace and used crusader swords as fire tools. In Palestine Alex McNeur, a machine-gunner, recorded that ‘Our men have discovered many buried cities, Roman stables etc. Many of the oldest inscriptions in the old arrowhead writing.’ Edwin McKay recorded that he and some friends found empty sarcophagi, charnel pits and stone walls. Many men found coins and pottery. The Anzac Mounted Division’s Magazine Kia Ora Coo-ee printed articles describing finds and advising men where to dig. Chaplains often found themselves leading the archaeological parties or interpreting finds brought to them by soldiers. New Zealand soldiers participated in some spectacular finds. One was a stele that recorded the history of failed attempt to build a canal in the 6th century BC connecting the Nile to the Red Sea by Pharaoh Necho II. The stele, inscribed by Persian emperor Darius I, had been erected around 497 BC. Another was the Shellal Mosaic. This mosaic, discovered during the Second Battle of Gaza on 17 April 1917, formed the floor of a Christian church built in AD 561. Turkish soldiers had dug two trenches through the mosaic, but the remainder was painstakingly excavated by New Zealand and Australian soldiers, and was later installed at the Australian War Memorial in Canberra. By First World War standards the human cost of the campaign in the Middle East was light: the New Zealanders suffered 1,470 casualties, including 543 dead. While the effects of the campaign were keenly felt by the bereaved families in New Zealand, those living in the region were affected in a profound way. By ending hundreds of years of Ottoman rule in Sinai, Palestine and elsewhere in the Middle East, the Allied victory in the campaign changed the region forever. A New Zealand soldier sits outside the Tomb of the Virgin Mary, Jerusalem. Image courtesy of the National Army Museum, 2014.231.1.